Amano shrimp (Caridina multidentata), also known as algae shrimp, yamoto shrimp and Japanese swamp shrimp are a popular shrimp for freshwater aquarists and aquatic plant enthusiasts. The shrimp are said to have been introduced to the aquarium trade by Takashi Amano, a Japanese aquarist. He found that the shrimp excelled at keeping planted aquariums free of algae growth. 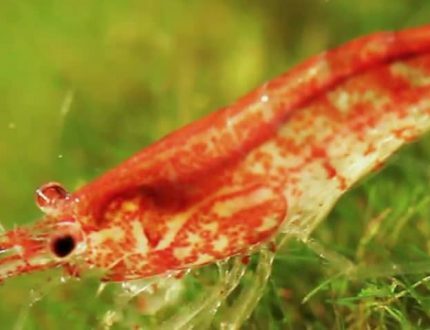 The shrimp were later given the common name “Amano shrimp” in honor of his work to make them available to the aquarium hobby. Caridina multidentata have the typical shrimp body form. The body is translucent with a gray or greenish tint, and covered with reddish brown spots along its sides. The top of the shrimp has a white stripe that runs from the head to the tail. Amano shrimp have small, black eyes. The shrimp grow to about 2.0 inches at maturity. Smaller shrimp are often found in fish shops and on-line sellers. Amano shrimp are very popular in the aquarium hobby, especially as a natural algae control in planted aquariums. Caridina multidentata are native to the Yamato River area of Japan and parts of Korea and Taiwan. Typical habitats are slow-moving areas of rivers and rice fields. These environments have very soft, slightly acidic water. Other habitats, closer to urban run-off, have a pH as high as 8.5. The shrimp can tolerate a temperate range of 68°F to 85°F. In the wild, Amano shrimp are found living among aquatic plants, branches and rocks. Amano shrimp prefer slow-moving water. They will venture out of their protected habitat to search for food. They are most comfortable climbing on plants and other structures, looking to scavenge food. Their natural diet is algae and detritus (tiny bits of organic matter). If you’re a strict shrimp enthusiast, you are probably going to be keeping Amano shrimp by themselves in their own aquarium. The perfect size shrimp aquarium is between five and ten gallons. Caridina multidentata like living in groups, so it’s best to have several Amano shrimp in the aquarium. It’s also possible to keep Amano shrimp in a community or planted aquarium if all the fish are shrimp-friendly. Amano shrimp will scavenge through the gravel, looking for bits of organic matter and other foods. They seem to enjoy working through finer grains of sand and gravel. Experienced shrimp-keepers have had success keeping the shrimp in aquarium without plants but the shrimp are most interesting when there are plenty of plants, caves and driftwood to explore. Experience shows that Amano shrimp don’t have special water chemistry requirements. But this does not mean they can tolerate poor water conditions. Maintaining a stable temperature and water free of ammonia, nitrite and nitrate are important to keep the shrimp healthy. Even low levels of these pollutants will stress your shrimp. Long-term exposure to ammonia or nitrite will weaken the shrimp’s immune system, and shorten its lifespan. Amano shrimp can be kept in a pH range of 6.5 to 8.2. Neutral to slightly alkaline is recommended by shrimp experts. Water hardness and alkalinity (carbonate hardness) are not critical. A range of 3 to 10 degrees is acceptable. If the aquarium water has low alkalinity, the pH may become too acidic over time. Alkalinity stabilizes pH. Natural acids produced by the break-down of wastes and biological filtration neutralizes alkalinity. If the alkalinity drops to less than 3 degrees, the pH could suddenly drop below pH 6.0. Test pH and alkalinity every week or two to keep a close watch on these important water chemistry parameters. Water changes, made every three to four weeks, will usually replenish alkalinity and stabilize the pH. Set the aquarium heater to maintain a water temperature of 72 to 78°F. Cooler water seems to prolong the shrimp’s relatively short lifespan. You’ll have to balance the water temperature to satisfy the fish’s requirements if you’re keeping shrimp with tropical fish. An aquarium thermometer is helpful for making sure the heater is keeping the water temperature at the desired set point. Caridina multidentata don’t like to be continuously exposed to strong currents. Cover from plants and caves allow the shrimp to have a quiet area with low flow. Don’t be surprised to see your shrimp exploring the aquarium filter’s outflow! Amano shrimp will investigate a high flow area, but they don’t want to be continually buffeted with water currents. If you plan on keeping Amano shrimp in a small dedicated shrimp-only aquarium, a hang-on-back (HOB) filter is all you need. A HOB power filter will filter the water and have a water flow rate that is compatible with the shrimp. The filter cartridge should contain activated carbon to remove odors and adsorb dissolved organics. If you’re adding the shrimp to a larger planted or community aquarium, consider a canister filter. Canister filters hold more mechanical filter media to remove particles and keep the water clear. The filter will also hold bags of activated carbon to remove dissolved organics and odors. Canister filters sometime include biological filtration media. The biological filter media provides a place for beneficial waste-degrading bacteria to live. Regardless of type of filter you have, be sure to change the media once a month. A dirty filter cartridge or canister filter will still flow, even when clogged. Many aquarium filters are designed to allow water to bypass the filter media even when it becomes clogged. This safety feature ensures the filter still circulates water, even if the media are clogged with debris and sludge. The organic sludge will decompose inside the filter if not cleaned out each month. Dirty, neglected cartridges and media release algae-promoting nutrients, like phosphate, into the water. This will cause green water blooms and algae growth on the glass, gravel and ornaments. Maintain the filter and your water will stay clean and clear. Amano shrimp don’t have any special lighting requirements of limitations. But if you want to see the delicate markings on the shrimp, you’ll want an aquarium light. If you’re growing live plants, good full-spectrum lighting is essential. Some nano all-in-one aquariums come with a tiny LED light that will provide a minimal level of illumination. This will be good for a tank without plants. But remember, Amano shrimp like to eat algae. Without algae you’ll definitely need to feed them a balanced shrimp pellet. You’ll want a brighter light if your aquarium has live plants. Fluorescent light fixtures available in several lengths that match traditional rectangular, glass tanks. New LED lighting fixtures are gaining in popularity, especially with the newer designs and modern-shaped aquariums. Fluorescent aquarium lights come with a plastic lid and light fixture. It works as an aquarium cover, lid and a light for traditional-style aquariums. Many fluorescent bulbs are designed to bring out the artificial colors of bright aquarium gravel, plastic plants and ornaments. If you want a more natural color tone or to keep aquarium plants, look for daylight-style fluorescent lighting. Remember, fluorescent bulbs dim with age. The bulbs gradually degrade over a period of 9-12 months. You’ll have to replace the bulbs to maintain the same level of illumination year after year. LED aquarium lights are more energy efficient, add less heat to the water and last for many years. Most LED aquarium lights don’t include a hinged hood or aquarium cover. The LED fixture is placed above the open aquarium. LED aquarium lights can be very thin and sleek. Tank-mounted LED lights will have adjustable mounting legs that straddle the ends of the aquarium frame. Many LED fixtures come with a built-in timer. For a little more money, you can buy fixtures having more LEDS for better light coverage. This is helpful for taller aquariums or and raising live plants. Amano shrimp want to forage for algae growing on live and plastic plants, driftwood, and rocks. Their nature is to explore, picking at everything with their tiny claws. Amano shrimp are algae-eaters. They’ll patrol the aquarium in groups, continuously harvesting algae cells and stringy algae. 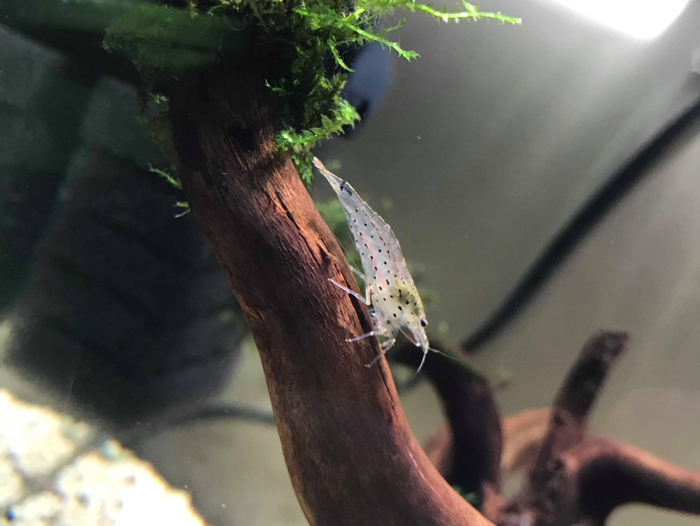 Amano shrimp won’t eat aquarium plants. They’ll forage on the plant surface, picking off tiny bits of microscopic life they find tasty. If your aquarium does not have much algae, it’s a good idea to give the shrimp a little extra food. You can feed your shrimp algae flakes, pellets and algae discs. They’ll grab and eat the tiny pieces of food. Java moss is another favorite feeding station. Amano shrimp are often kept with non-aggressive tropical fish. Any fish large enough to swallow a shrimp should be avoided. 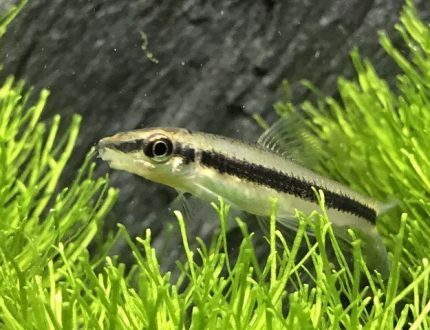 Juvenile “aggressive” fish, even though they are small, can bite and try to eat a shrimp even though it is too large to swallow. Most community tropical fish like angelfish, platys, mollies, swordtails and even dwarf cichlids are friendly toward ghost shrimp. Caridina multidentata is amphidromous. This means the life cycle and breeding requires both fresh and saltwater. Pairs will mate in freshwater streams and marsh areas that have access to seawater. Female Amano shrimp release chemical attractants (pheromones) into the water to attract male shrimp. Once fertilized, eggs are released and go through the larval stages in brackish and then salt water as they drift out to sea. The shrimp eventually return from the sea once they reach maturity. They stay in freshwater and mate, for the remainder of their lives (2-3 years). Breeding Amano shrimp in the aquarium is very difficult. 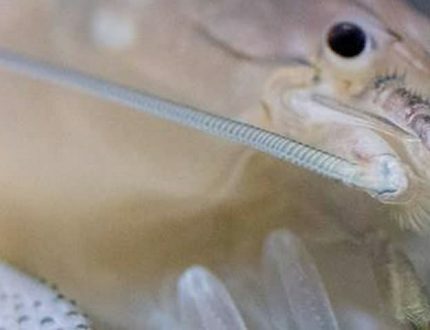 It is reported that all Amano shrimp sold for aquariums are wild-caught. 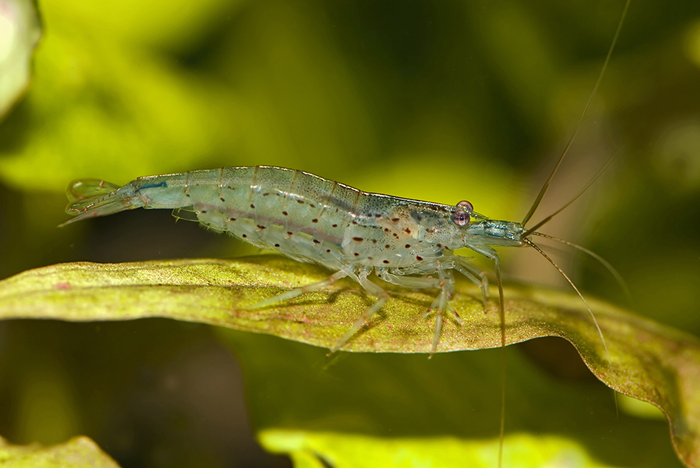 Amano shrimp have a legendary reputation as algae-eliminators in planted aquariums. They’re perfect for a peaceful community aquarium too. The shrimp’s curiosity and interesting behavior will provide hours of fun!